Utilize the best Word file repair tool that will help you to recover corrupted or damaged MS Word documents. The utility supports recovery of both formats (.doc & .docx) of Word documents in a few simple steps. 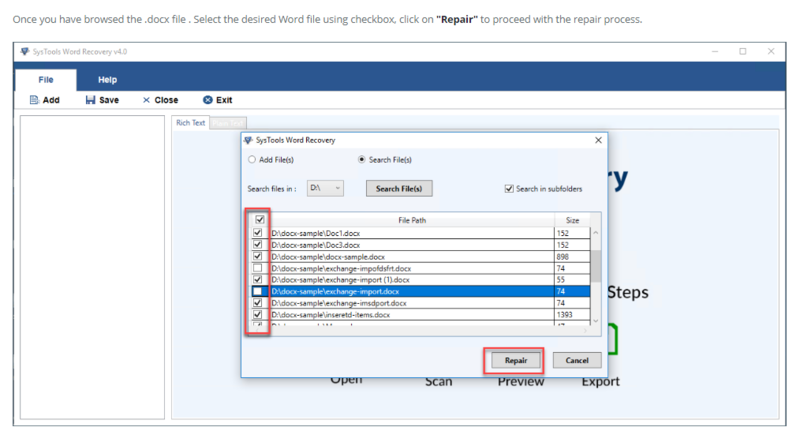 Several options of performing recovery to fix Word file errors. Scans and displays corrupted/damaged Word document data. 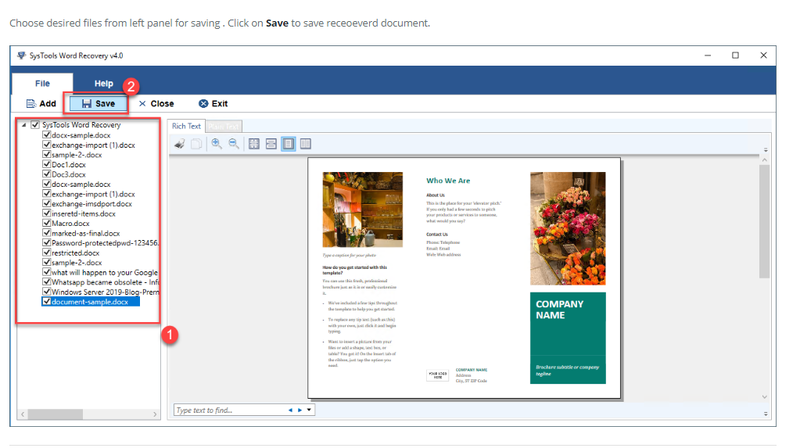 Recovers MS Word file into a healthy DOC, HTML and TXT file format. MS Word Recovery supports DOC & DOCX both of Word file formats. 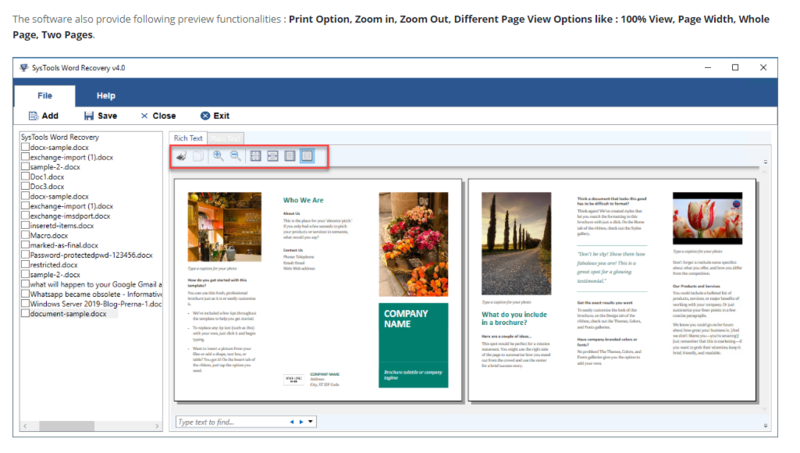 Preserves text style, formatting and HTML effects as it is from documents. Compatible with all Windows OS versions like; Win8.1, 8, 7, & XP, etc. This is initial feature of the Word Recovery software that scans corrupted DOC/DOCX file and shows a complete preview before exporting to a healthy file. Even if the MS Word DOC or DOCX file is majorly damaged, you can still repair every single word contained within it using the software. You can easily recover corrupt Word file without missing any of the vital information. The Word repair tool keeps formatting like; hyperlinks, italic, or bold text, etc. The tool offers 3 different recovery modes such as: Quick Recovery, Image Recover, and Salvage Recovery which all can be used according to your requirement. With this elevated Word Recovery Software user can repair corrupt files along with other elements retained like their font, images, original size, headers & footer. Once the recovery process gets over, one can save the file into one of the featured file formats. The software provides 3 formats to save the documents such as: DOC, HTML and TXT file. Repair Word files of any extension (DOC or DOCX), no matter what version of MS Word is being used. The tool supports Microsoft Office 2013, 2010, 2007, and 2003 etc. This tremendous software has the ability to perform recovery process for lifelong. You can recover innumerous MS Word docs without any limitation. Why MS Word Recovery Need to be Executed? MS Word is much preferred by the professionals for documentation. But sometimes users face issue while accessing Word file due to corruption and he/she requires repairing the corrupted Word documents. How to Repair Corrupted Word File? If you are facing problem in accessing the content of your MS Word file? Then no need to get tensed as now with the help of an advanced Word Recovery tool you can repair Word Doc files without losing any information stored in it. Now repair Word Doc file of any version, whether it is a .doc or.docx file. This Word repair software is one of the most user-oriented software which is developed with advanced algorithms that offer a superior way to repair Microsoft Word document even if it got corrupted due to reasons like; dirty shutdowns, virus infections or system malfunctioning. Being a professional tool to repair Word files, it enables its users to recover data from corrupted or damaged Doc and make it an accessible file all over again without any data loss. Free MS Word file repair tool only provide the preview of recovered data and does not allow to save them. Step 4: Preview the complete List of Recovered DOCX files on left lane and respective file on the right with Rich Text features. Step 5: on the left lane, select files that are to be saved. Click on "Save" button to save Recovered Document. Can I repair damaged Word document file of MS Office 2003? Yes, the Word Recovery Software supports both (.doc or .docx) of a Word document file. 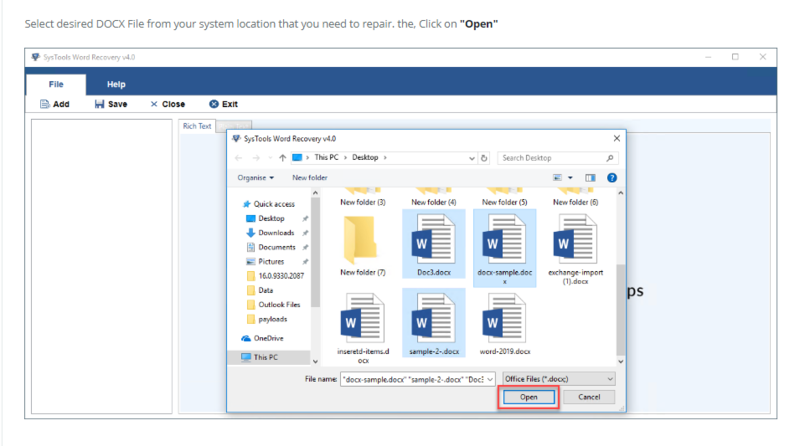 So you can easily perform the recovery for your MS Word file of any version. How many DOC or DOCX files can the software recover at once? One file can be recovered at a time and the process can be repeated back to back for recovering a number of Word documents. Does this MS Word Recovery Software Utility Recover Deleted Data? No, you cannot recover deleted data from the MS Word document file. The tool repairs data from corrupted Word file to a healthy file. How does Salvage Recovery Function? 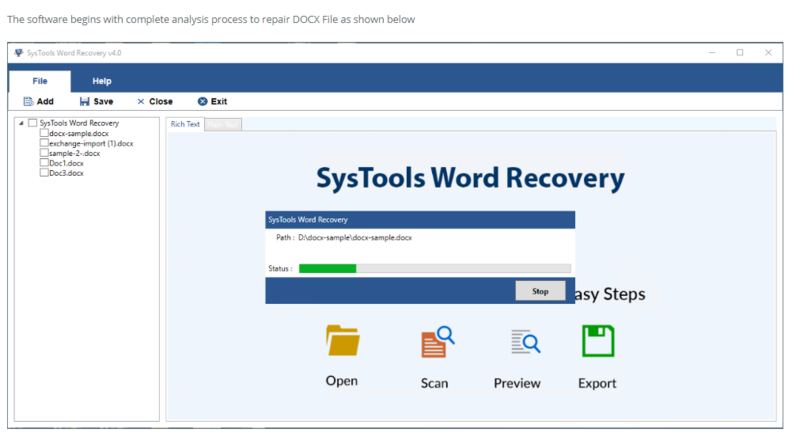 If your Word document is severely damaged and you are unable to get information back from it, using Quick Recovery mode then, use Salvage Recovery mode to recover data from highly corrupted Word file. I was disappointed due to docx file corruption, but QuickData Word Recovery software really helped me to recover back the precious data from the file. I just want to say a big thanks to developer for providing such helpful tool. 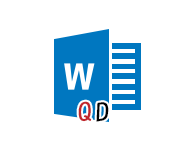 I am very thankful to QuickData for offering such effective application to recover damaged doc file in a few steps. I have never seen such an easy to use application that performs the entire recovery procedure in 3 or 4 easy steps only. My Word document got corrupted that was very important to me. 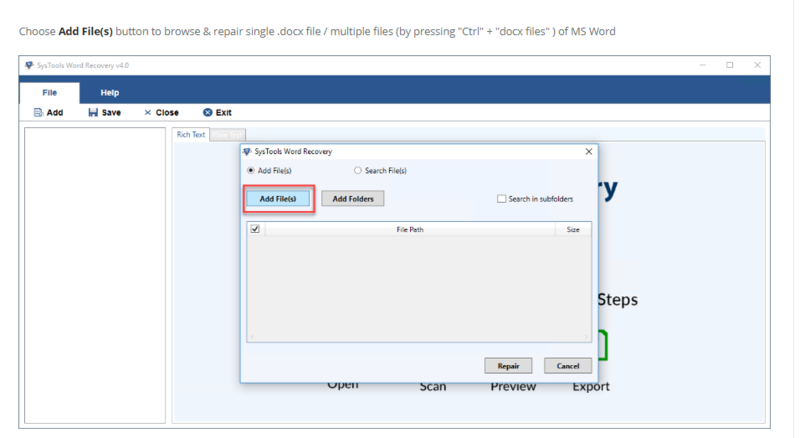 Repairing that corrupted MS Word file was a hard task for me, but QuickData Word file repair tool helped me to do it with least efforts required. Thanks to the entire team of QuickData. Word File Repair tool really surprised me when I run it to recover a damaged .docx file. Only two or three steps are required to perform the recovery process. Salvage recovery function of the tool make it more powerful.